Born in Hong Kong, Elaine Ling has lived in Canada since the age of nine. Seeking the solitude of deserts and abandoned architectures of ancient cultures, Elaine Ling has explored the shifting equilibrium between nature and the man-made across four continents. 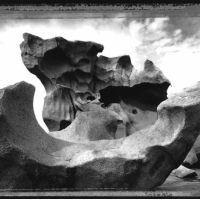 Photographing in the deserts of Mongolia, Namibia, North Africa, India, South America, Australia, American Southwest and the citadels of Persepolis, Petra, Cappadocia, Machu Picchu, Angkor Wat, Great Zimbabwe, she has captured that dialogue. In Havana, a city caught between the decay of the immediate epoch and the grandeur of past glory, She found an urban landscape that reflects a similar struggle between daily life and the slow forces of Nature. Havana echoes the architecture of a decadent past. However, tangible new energy of reconstruction and restoration stages this city's rebirth. The abandoned pleasure gardens and the intimate interiors of homes are in the flux of metamorphoses. Ling has exhibited extensively in North and South America and Europe. Her recent solo exhibitions include Houston Fotofest, Fototeca Bienal Cuba, Griffin Museum of Photography USA, Foto Arte, Brasilia and FotoRio, Rio de Janeiro Brazil; Britanico, Lima Peru; Encuentros Abiertos, Buenos Aires Argentina; Bratislava Photofest, Slovakia; Fototage, Mannheim Germany; Museo Antioquia, Medellin Columbia; Houston Center of Photography; Musee de la Photo a Charleroi Belgium; and Prague house of Photography. Her photographs are in the permanent collections of the Museum of Fine Arts Houston, Texas, the Henry Buhl Foundation in NYC, the Brooklyn Museum, the Musee de la Photographie in Charleroi, Belgium, the Bibliothèque Nationale de France, the Museet for Fotokunst in Odense, Denmark. Based in Toronto, in Canada she is collected by the Royal Ontario Museum, Ryerson University, Windsor Art Gallery, and the Canadian Museum of Contemporary Photography in Ottawa. Ling has published in Aperture, The Polaroid Book 2005, View Camera, The Photo Review, Powerhouse Review and Artweek in the US, fotoMAGAZIN, PHOTO Technik International, PHOTONEWS and PROFIFOTO in Germany, FOTO in the Netherlands, Katalog in Denmark, Cuba Chronicles in Brazil, Reflex in Mexico, Canada World View, Photo Life and the Medical Post in Canada.